WRITING CONTEST FINALIST: It is up to the American people to insist that corporations are not people, money is not speech and elections are not up for sale. For decades, corporations have wreaked havoc on our democracy from impoverishing the working class, profiting off military conflicts, poisoning the environment and food supply and taking over public schools. Perhaps, their most destructive target is America’s broken political system. Corporations have played a role in elections since the early part of the twentieth century. It was during the presidency of Ronald Reagan that we saw an increase in their hegemony in politics. But it wasn’t until the 2010 Supreme Court Citizens United ruling, which gave corporations the same free speech rights as individuals, that the corporate sector comprehensively put its stamp of influence on America’s elections. Shortly after the decision, Super PACs were created and a tsunami of money poured into subsequent election cycles. While donors can’t contribute directly to candidates, they are permitted to bankroll unlimited sums of cash to these federally registered political action committees, which can then endorse specific candidates. By law, no one can force Super PACs to disclose the names of donors, thus creating a trail of dark money. It’s a win-win for the rich who can write million-dollar fat checks without any public scrutiny. Harvard Law School professor Lawrence Lessig found that just 196 Americans gave more than 80 percent of the individual Super PAC money in the 2012 presidential election. In the entire 2012 election, “ten times what was spent a generation ago, even allowing for inflation,” a cringe-worthy $10 billion was burned through, according to Nation writer John Nichols’s new book, Dollarocracy. With the need to raise more money to win elections, members of Congress spend nearly all their waking hours on the phone cajoling potential donors. Subsequently, there is a ballooning lobbying industry. In 2009, lobbyists spent $3.5 billion, or roughly $6.5 million per each elected member in Congress. There is also a revolving door between K Street and Capitol Hill. In the past decade, a study found that almost 5,400 former congressional staffers later became federal lobbyists. Contrary to prevailing sentiment, most of the practices lobbyists are engaging in aren’t illegal. Almost no one is forking over money in return for votes, but rather they take an indirect approach through what Lessig calls the “gift economy.” In his book Republic, Lost, he defines the gift economy as “grounded upon relationships, not quid pro quo.” Lobbyists do a series of favors—fundraising dinners and galas—and slowly build an intimate relationship with the politician. Eventually, they make the person “lose his sense of mission to the public and comes to feel that his first loyalties are to his private benefactors and patrons,” as the late Senator Paul Douglas aptly explained. The politician is successfully in the pocket of the lobbyist. Corporations will attempt to preserve the status quo at any cost. If they are somehow unable to persuade politicians in voting for a piece of legislation they don’t like, they spend inordinate amounts of money to try to have the bill watered down to the point of ineffectuality or push litigation to stonewall the implementation. 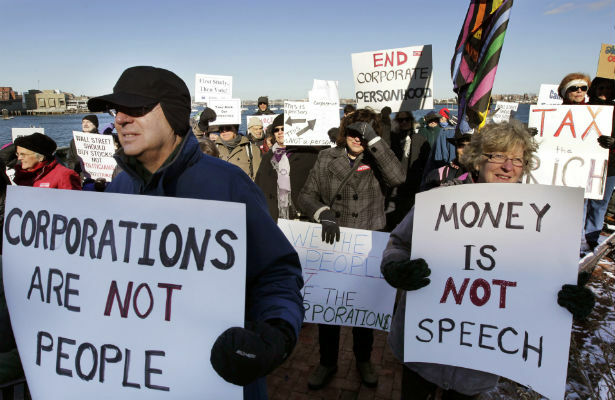 We need a constitutional amendment to overturn the Citizens United ruling. That would require, first, a two-thirds majority vote in both the House and Senate and, second, three-fourths of state legislatures. As of June 2013, fifteen states have already passed state resolutions and ballot initiatives calling on Congress to begin the process. We could also take a leaf out of President Theodore Roosevelt’s playbook. In an annual message to Congress in 1905, he stated, “All contributions by corporations to any political committee or for any political purpose should be forbidden by law; directors should not be permitted to use stockholders’ money for such purposes.” Congress, in response, passed the Tillman Act of 1907, banning political contributions by corporations. Our country has been hijacked by corporations and sugar daddies—“old, white, rich men,” as New York magazine’s Frank Rich puts it. We no longer live in a democracy but instead a plutocracy. Affecting both the left and the right, big money crowds out the voices of the oppressed, the poor, and minorities. Elections are being sold to the highest bidder. We are living in a time that resembles the epochs of nineteenth-century robber baron politics and the presidency of Richard Nixon than ever before. In Nixon’s time, it was illegal to solicit secret campaign donations from corporations, and the resignation of the presidency was the price he paid. Attention College Students: Get six months of The Nation's digital edition absolutely free! It is up to the American people to insist that corporations are not people, money is not speech and elections are not up for sale. Without extraordinary changes to the campaign finance system, politics will remain broken, lobbyists will continue to run amok on Capitol Hill, and we will be indentured by a government of the corporations, by the corporations and for the corporations. Nikhil GoyalNikhil Goyal is the author of Schools on Trial: How Freedom and Creativity Can Fix Our Educational Malpractice (Doubleday/Random House, 2016).